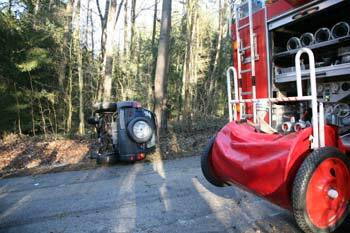 On 02/03/2008 at 02:48 p m the fire departments of Nittenau and Bergham and the VFD Nittenau First Responder Nittenau were called for a severe motor vehicle accident between Nittenau and Bodenstein. Dispatch said "severe motor vehicle accident, one person trapped, car burning". 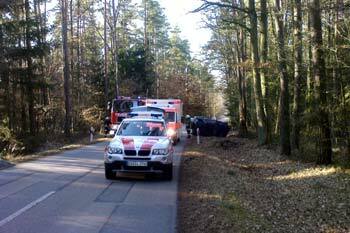 At this time the carnival parade in Nittenau was running and the fire departments of Nittenau and Bergham were controlling the traffic. Thus, several firefighters were already equipped with their gear. The required engines could respond very quickly as well as a police unit which was controlling the parade. The First Responder was on scene immediately after the police. 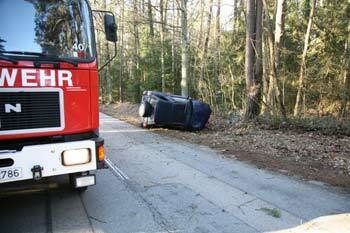 A car had crashed against a tree and was lying on the curbside. The engine bay was already burning, the fire was yet developing. By using the fire extinguishers of the police and First Responder the fire could be stopped. 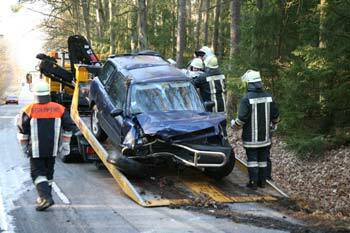 Luckily, the driver was not trapped in the car. Police, First Responder and passers-by pulled him out of the car via the tailgate. Besides smoke poisoning he didn't have serious injuries, his outcome was rated good. The shortly after arriving firefighters performed damping-down operations, traffic control and wash down.